The Terex TSV50 and Terex TSV60 were designed with 2 purposes in mind, to outwork any machine in its class, and to keep the operator comfortable while doing it. With These two machines, Terex set a new bar for every other manufacturer of Skid Steers. Monster Tires knows that even with being a more powerful, maneuverable machine if your tires are cracked and constantly causing downtime none of that means anything. 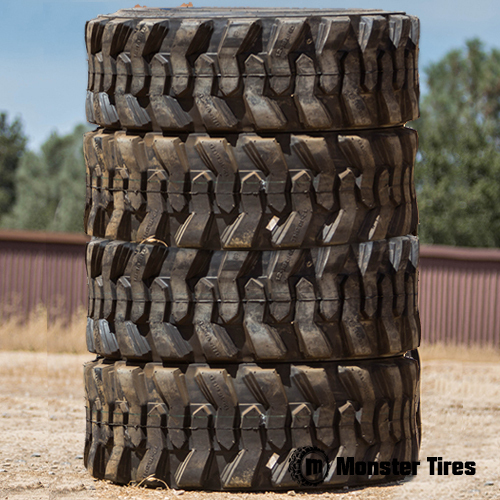 Monster Tires is here to keep your machines working hard for you by offering the most cost effective tires with the fastest and cheapest shipping times on your Terex TSV50 Skid Steer Tires and Terex TSV60 Skid Steer Tires.